A leash is a necessary accessory for every dog as a collar and other supplies. You should choose it very attentively. Our online German Shepherd shop offers the best models of leashes. 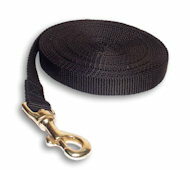 Here you can find canvas and nylon leashes, metal and tracking, couplers, over the shoulder leashes or show ones. In our store all leashes are high quality products. 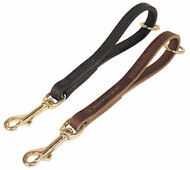 Due to your needs and different situations we propose the superior leashes. There is a great variety of colors and materials. It can be genuine leather, nylon, any length. We give a guarantee that the leashes bought in our shop will serve for a long time and will help to cope with German Shepherd dogs; this tool can distinguish you among the other owners. All leashes are made of high quality materials. This product is considered to be a special connecting link between dogs and their owners. If you choose a suitable leash to a collar, it won't cause a discomfort to your pet. That's why we offer a wide range of collars and leashes. All thehardware on our leashes is made of high quality materials, it gives an assurance of their long service. Remember, as a professional dog-fancier you have to keep various leashes for different occasions. Leashes that are represented in our store combine an excellent quality and low prices. Don't put yourself in an awkward position using an ordinary rope. This type of supply is as important for a dog, as a tie for a businessman. Leashes differ in materials they are made of, and also in spheres of application. It's clear that show leashes can't be used while dogs training. The most popular materials for leashes are the following: nylon, tarpaulin, leather, leatherette, metal (chain). According to the sphere of application leashes are divided into: leashes, chains, cords, pull tabs, couplers, over the shoulder, show or roulette leashes. You have to be serious in choosing a leash according to the size, age, character and breed of your dog. The quality of the metal leash elements is very important for this tool. They must be qualitative and welded. Even the strongest leash loses all its advantages having a weak defective snap hook. Besides you can buy a snap hook separately, especially if your German Shepherd is big enough and strong. 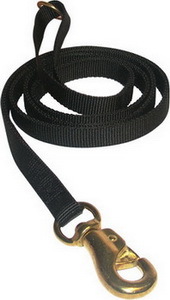 If you need a leash for training, you'd better to buy a nylon or canvas supply. Generally their length varies from one to twenty meters. The price of such leashes depends on length and reliability of a snap hook. 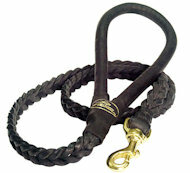 These leashes are durable and withstand huge loads. Be attentive choosing a nylon leash, such model is beautiful but it can slide in your hands and burn palms. And one more – the most durable leash can be easily gnawed through by dogs. Remember it before tethering your pet. When it is necessary to keep your German Shepherd on a leash for a long time, use a rope with spring-damper or a chain. Don't follow the beauty and don't buy a chain leash made of stranded wire. A chain for leashes must be welded. And don't forget about a durable snap hook. You can also apply a chain to wean your dog from chewing it. The length of the chain leashes isn't more than five feet. These products combine organically with metal collars. But take into consideration that the weight of a metal collar and a leash together can be too much for your pet, so he can feel discomfort. If you leave your doggie on a leash for a short time (for example, going to a store), the best variant is a multifunctional leash. This device is two meters in length with several rings in different places. It allows controlling its length depending on the situation. Also multifunctional leashes can be used in dogs training. Be sure the leash to have a double stitching without additional decoration that can hurt your palm. Note that the roulette leashes also give an opportunity to regulate a length. If you are the owner of a big and strong doggie, you have to buy a pull tab. It's a short leash that consists of one loop andmassive reliable snap hook. But the disadvantage of this model is a short length and a lack of its regulation.